Monday was my last day in New Orleans, and I used it to bike as many places as possible. When I first moved to NOLA in 2007, there were no bike lanes. Then the St. Claude bike lane went in, and then there was one on Broad Street, and that tiny stretch of Magazine in front of the WWII Museum, and the protected bike lane out in Gentilly, and now they are all over the place, and I wanted to ride them all. I wanted to take that favorite ride out through City Park and to Lake Pontchartrain to see the bayou and look for pelicans. I wanted to get lost out in Gentilly and do laps around Audubon Park and ride the Mississippi River Trail out to the end to see what they’ve done to that riverfront park in Kenner and if that abandoned suitcase is still there. The streets are all familiar, but they are fading, and I wanted to retrace all my steps. But I only had the day, so I reminded myself that I can return, and took Brompty on the most important rides: Uptown for brunch with N. and then over to Mid City for lunch with J. and D., and then it was time to make my pilgrimage to Chalmette National Battlefield. I love that place. It’s an easy ride from anywhere in town, out the St. Claude bike lane, past the new bars and the old one, the new wellness center/coop that used to just be an orange storefront and giant elephant in the window. The McDonald’s is still there, but now it’s surrounded by restaurants and coffee houses that I never expected to see out this far on St. Claude. I pedaled slowly over the Industrial Canal, steeling myself against the quick traffic, more than I remembered. The first house on the other side is falling in now, and that part where “everything’s different” in New Orleans, well, this ride sure belies that thinking. The Waffle House and the Dollar Store are there, and the snoball stand’s selling tamales now, but otherwise it still has the look of a place abandoned by capital, in spite of the streetscaping they’re doing for a few blocks right over the bridge. 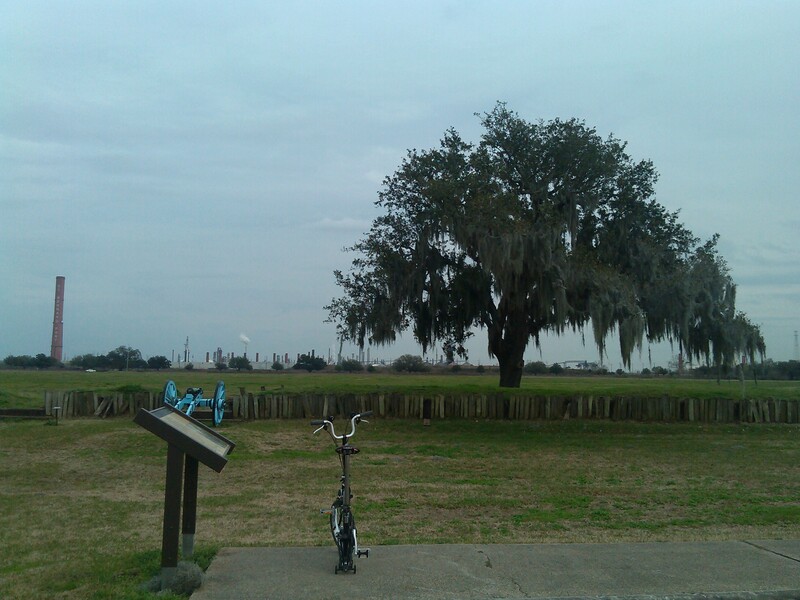 And then I was across the Jefferson Parish line, taking my right into the park, and then this: the empty battlefield framed by battlements, the loan tree with its lazy Spanish moss, the interpretive sign describing elements of the battle in ways that evacuate all the people, the tower announcing Jefferson Parish, and the horizon, which here is all factory and refinery. I rode the perimeter, stopping to read the new sign about Fazendeville, which reinterprets the dislocation of African American families from this land so it could become this national park as a relocation to the 9th Ward, and then watching silently as the white heron snacked in the wet field before spreading its wings so wide to fly away, and the gaggles of ibis sticking their needle noses in the swampy bits over by the graveyard. It is so beautiful and complicated here, and oh, it was the perfect day. And then it was a reverse course back to the city, past the new buildings of the Bywater–now that’s a neighborhood that’s really changed–a stop for beignets, and then back uptown to meet folks for drinks before snaking back to the Treme on Simon Bolivar to see if that Mr. Planter’s Peanuts Park was still there (it is) and if they’ve repaved that terrible stretch of Basin (they haven’t, but the bus/bike lane is awesome). A whole day biking all over New Orleans, just like old times. Lucky, lucky me. This entry was posted in bikes, cemeteries, history, military, neighborhoods, parks, personal and tagged bike lanes, birds, Bywater, Chalmette National Battlefield, Mid City, New Orleans, Treme, Uptown. Bookmark the permalink. It is nice for me to also revisit the places you took us too so many times in NOLA. I am SO glad you got that ride in. Yes, lucky you. Beautifully written Dr. Drabinski. I could see it all with you as my tour guide. Someday I will. If anybody’s lucky it’s us, reading this. Wish I was there.